The best swimming goggles are stylish and effective. When it comes to buying the best swimming goggles, most people concentrate on getting the ideal fit and features they want. While this is still an essential aspect of competition swim goggles, there’s more to it than that. There’s also fashion. This is why the Speedo FastSkin3 Elite mirror racing goggles are now available in a number of fun new colors, just in time for the outdoor swimming season. One of the biggest reasons swimmers choose the Speedo FastSkin3 Elite mirror racing goggles is due to the amazing features they offer swimmers. Not only are they a sleek, stylish design, but they also offer all the advantages swimmers are looking for in competition swim goggles. For instance, these goggles boast a low-profile design for less resistance in the water and wider peripheral vision than many other swim goggles available on the market. They also offer the revolutionary 3D seal, which fits face contours better than any other swim goggle on the market for a comfortable fit and no leaks. The straps also feature a seamless design so swimmers no longer have to deal with loose ends. These Speedo swimming goggles have previously only been available in black and white, giving swimmers a stylish pair of goggles but drastically limiting their options. 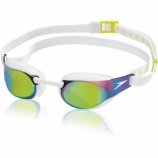 However, the latest news indicates these best swimming goggles are now available in three new colors. Swimmers will be able to better coordinate with their competitive swimwear by choosing from orange, Kelly green or pink swim goggles. This allows swimmers to show off their sense of style while keeping their eyes protected in the water and improving their swim performance. If you’re looking for the best swimming goggles for the upcoming outdoor swim season, the Speedo FastSkin3 Elite mirror racing goggles are one of the top options for swimmers of all skill levels. With the outdoor season coming up, now is the time to invest in a great pair of competition swim goggles that fit with your sense of style, along with providing the features you need in your swim goggles. If you’re looking for the best competitive swimming gear in Dallas, Texas, contact us. We carry the best swimming goggles to help you see better, feel more comfortable and look stylish.